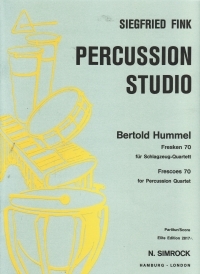 Written in 1970, the work attempts to apply a chamber-music approach to a percussion ensemble. Each of the four players uses a mallet instrument and a limited number of membrane instruments, plus selected, harmonized wood and metaI idiophones. The first movement (Introduction) is played solely with mallets: vibraphone, marimba, xylophone and glockenspiel. Each of the 4 instruments is given the opportunity to introduce itself. The second movement (Counterpoint) begins with membrane instruments only. In the middle section wood idiophones are added. There is unison at first for the subsequent four-part canon, which ends in a pedal point. A short reprise of the membrane instruments - interrupted by the canon's thematic peak - closes the movement. In the Rubato (3rd movement) the mallets and wood idiophones are joined for the first time by metal idiophones. This movement is characterized by sound expanses and short-motive stretti. In the Polymetry (4th movement) three differently structured rhythmic models are superimposed (membrane, wood and metal idiophones) and developed with opposing dynamics. They underlie a vibraphone solo on a rising path. Reaching its peak, the solo breaks off, the polymetric "background" dissolves and vanishes. The fifth movement (Finale-Conclusion) brings the entire instrumentation together. A bell-like "motto" gives form to the rondo movement, which is interrupted by cadenzas (vibraphone and marimba). This movement can also be seen as a development of the ideas that have appeared in the whole work.